Urban Decay Naked 3 and where to get it! All over my Twitter feed, in blog posts and magazine articles I’ve been hearing how amazing the Urban Decay Naked pallets are. Every time I try to find one to buy I’m always just too late. Now, I’ve literally just had news that there is a limited amount of stock of the Urban Decay Naked 3 Pallette available in a bundle with the Urban Decay Eyeshadow Primer Potion Original for £53.00. 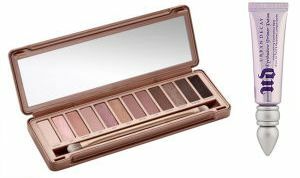 They say “Urban Decay Naked 3 Palette: Contains 12 brand new matte, pearl and metallic shades which range from the most delicate pastel pink to deep black, the set contains every colour you need to give your peepers a hint of subtle shimmer. Formulated with the Pigment Infusion System™, the colours have superior blendability, pigmentation and staying power, so you can achieve a long-lasting effect. To soften the blow to the purse you can get 15% off when you spend £50 here if you quote Code: FEBSPEND Valid until midnight on the 25th of February Exclusions apply. If this isn’t up your street but you still have cash to spare there are some goodies that are exclusive to Lookfantastic here including the Ciate Caviar Mini Bar Volume 2, and Daniel Sandler Baby Jet Mascara Duo. You can get 10% off if you quote Code: FEBSAVE Valid until midnight on the 25th of February Exclusions apply. If you’ve tried these products before or if you buy them now do let me know what you think. I have to wait until payday before I can treat myself and I fear the stock will be long gone by then, sigh!